Kitchen Experiment: Roasted Veggie Medley – The Small Things. A few weeks ago I shared that I had been doing some cooking! Regular readers will know that this is a scary thing for me. But I also shared that my last two Kitchen Experiments were successful! Wooo! I had also promised to share the recipes! So today I am sharing my Roasted Veggie Medley Recipe. I’ve only got the one picture (I’m no food blogger after all) but my oh my it does look yummy doesn’t it?! And it’s healthy too! This dish is a great side dish for any meal. Note: There aren’t exact measurements for this recipe. The “measurements” below fed 5 people and provided left overs. But make adjustments as you see fit. 2. Peel and chop the sweet potato and carrots into cubes. Put into casserole oven dish. 3. 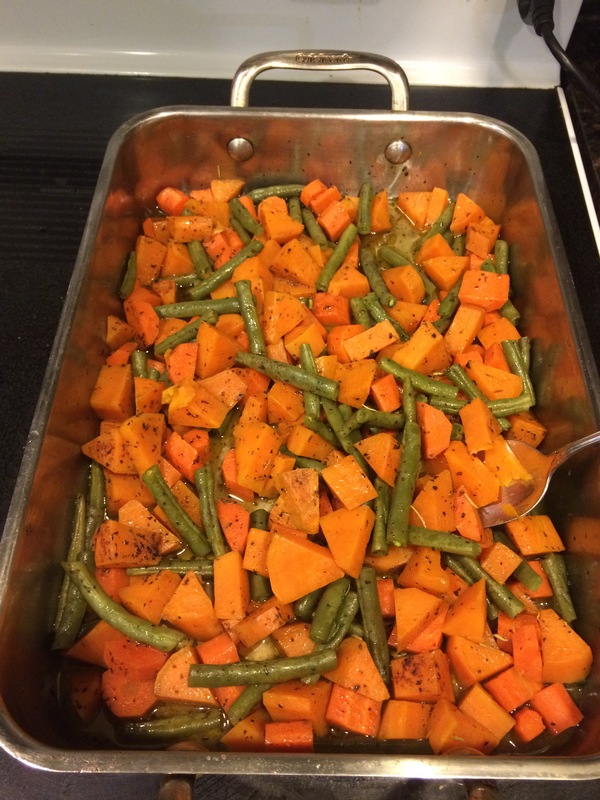 Wash green beans, remove the end and put into casserole dish. 4. Coat veggies with EVO. 5. Shake spices over veggies. Distribute evenly. Amount of spices used is dependent on personal taste. I used more basil and cinnamon than rosemary. And I just used salt and pepper to taste. 6. Pour the veggie broth into the mixture and stir. Just make sure all your veggies have some oil and spices on them. Then cover with tin foil and pop in the oven for 40 – 50 minutes. When the sweet potatoes are soft it is good to go! If you end up trying it out let me know how it goes! I love pairing this with salmon or chicken. Thanks for reading!